This rich collection of predominantly reflection and sparse emission nebulosity exists in the western part of a vast star forming region known as the Mon R 2 association. The "R" designation stands for reflection and indicates an association of stars illuminating reflection nebulae. Most of the members of Mon R 2 are type B stars located along an east-west line stretching across 2 degrees of the winter sky, situated about 8 degrees east of the Orion Nebula. The Mon R 2 association resides at a distance of 830 pc and formed about 6 to 10 million years ago along the edge of the elliptically shaped Mon R2 molecular cloud (dimensions of about 130 x 60 pcs). 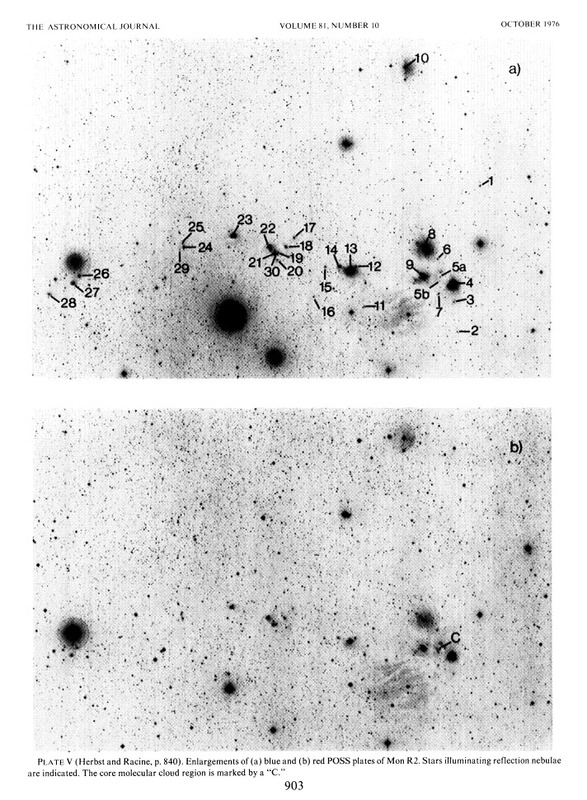 In 1966 Van den Bergh first identified this major clustering of nine reflection nebulae illuminated by an association of B-type stars. It has been suggested that massive stars form last in stellar associations and that their subsequent radiation pressure ultimately disperses the interstellar gas and dust from which lower mass stars have formed. The likely chronological evolution is: T-Tauri associations --> reflection nebulae and B-star associations--> HII regions and O-star associations. The existence of HII regions within Mon R 2 suggest it may be further evolved than other groups of reflection nebulae and that favorable conditions have just been reached for massive star formation. The Mon R2 cloud appears to have a preferred plane of active star formation. Curiously young low mass stellar objects seem to predominate along the apparently younger eastern side of the association while the HII cloud phase seems to have been reached in the older western side of the association. 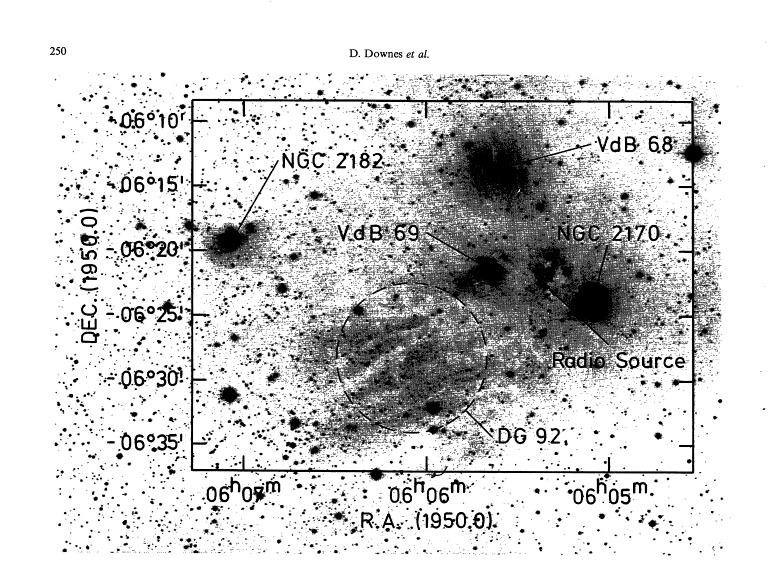 The core of the molecular cloud Mon R2 is associated with both a massive bipolar energetic outflow (one of the largest known outflows) and several radio sources thought to originate from water, formaldehyde, and OH Masers. Maser is an acronym for "Microwave Amplification by Stimulated Emission of Radiation". Masers form through the interaction between high-energy starlight and regions rich in various molecules. Both outflow phenomenon and maser acitivity occur in regions of very active star formation. These energetic phenomenon arise from the core of the Mon R2 cloud where a compact HII region and several dust embedded infrared sources have been identified, thought to be associated with pre-main sequence objects, presumably evolving hot B-type stars. The reflection Nebula VdB 68 shows the visible striations characteristic of older nebulae where the exciting star has begun to destroy the surrounding molecular material. The reflection nebulae NGC 2170 and VDB 69 show no such striations implying that they may be younger objects than VDB 68. The radio source also marks the core of the Mon R2 association. Core of the Mon R2 association is marked with a "C".